(April 26, 2018) -- Marcus Davenport became UTSA's first-ever NFL first-round pick when he was selected 14th overall by the New Orleans Saints on Thursday night at the NFL Draft at AT&T Stadium. 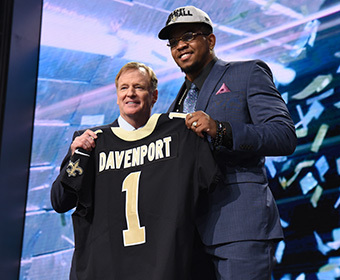 Davenport heard his name called by NFL Commissioner Roger Goodell when the Saints traded with the Green Bay Packers to move up from their No. 27 spot to the 14th pick to grab the 6-6, 265-pound defensive end. "I still don't realize that I just got selected No. 14 to the New Orleans Saints," Davenport told the media after his selection. "The Saints were my first-ever jersey and my first jersey was Reggie Bush. I've never seen my dad that excited and my mom was crying. I just want to be able to be an impact player and be able to help out any way I can." The 2017 Conference USA Defensive Player of the Year joins 2016 NFL Draft selection David Morgan II, who was taken 188th overall (sixth round, pick 13) by the Minnesota Vikings, as Roadrunners to be drafted into the NFL. Davenport, who was one of 22 prospects invited to attend the draft, is the first selection from a Texas university in this year's draft, the second native Texan selected (Baker Mayfield, No. 1 overall by the Cleveland Browns) and C-USA's highest selection since Louisiana Tech's Vernon Butler went 30th overall to the Carolina Panthers in 2016. "I'm so excited for Marcus, our program and our university," said head coach Frank Wilson, who now has put 30 players into the NFL. "Marcus really willed himself to be in the position that he's in now. I could not be happier for he and his family. For all the hard work and diligence that he's put in, he's so deserving of this day. "To see Marcus and his development, and to know that we still have young men on this team who have that type of capability, it bodes well for us and the future of our program." A three-time all-conference selection, Davenport set UTSA career records for tackles for loss (38.0), sacks (22.0) and QB hurries (21). Last season, he became the first UTSA player to win the C-USA Defensive Player of the Year honor after posting 55 tackles and setting school records with 17.5 tackles for loss, 8.5 sacks and eight quarterback hurries. He added four pass breakups, three forced fumbles and had a fumble return for a touchdown. The NFL Draft continues with the second and third rounds on Friday, which will air on NFL Network, FOX, ESPN, ESPN2 beginning at 6 p.m. Rounds 4-7 will be shown on NFL Network, ABC and ESPN starting at 11 a.m. Saturday. The NFL Draft can be heard nationwide on Westwood One Radio, SiriusXM NFL Radio and TuneIn Radio. NFL Now Live will provide comprehensive online coverage of each round of the 2018 NFL Draft NFL Now Live can be accessed at NFL.com/Draft and through the official mobile app of the NFL, NFL Mobile from Verizon, as well as the NFL app on connected TV devices and on desktop and tablet. Live NFL Network coverage of the 2018 NFL Draft is available across devices (smartphone, PC, tablet and connected TVs) through the NFL app or NFL.com/watch for subscribers of participating NFL Network providers.